Nottinghamshire’s England International Owen Kilburn recently returned from competing in the BWF Para-Badminton World Championships in Ulsan, South Korea. 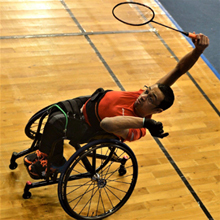 He took part in the Wheelchair Mens Singles, Mens Doubles with England’s Gobi Ranganathan and Mixed Doubles with England International Sharon Jones-Barnes. The group stage of the singles proved a tough challenge, coming up against the 4th seed and a very strong unseeded player from China. Losing 2 games against this strong opposition, he beat Canadian Mikhail Bilenki 21-6 21-15 and finished 3rd in the group of 4. The Mixed Doubles group stage proved to be equally as tough, losing to Swiss and Chinese Taipei pairs, but beating Finland’s Riku Vihreasaari and Heidi Manninen 21-9 21-15 and finishing 3rd in the group of 4. Owen and his Mens Doubles partner Gobi Ranganathan reached the last 16 play-off stage, having finished 2nd in their group round. They had wins over Turkish and Australian pairs, but lost out on the top spot with a defeat against a Brazilian/Japanese pairing. Owen and Gobi ended their tournament in the 1st Round Knockout Stage after a 21-8 21-6 defeat against Thai pairing Chatchai Kornpekanok and Aphichat Sumpradit.